SHGB Interview Schedule 2015 - Download SHGB Interview Letter for Office Assistant 2015 Download SHGB Office Assistant 2015 Cut off Result - SHGB Office Assistant List of Interview shgb.co.in. 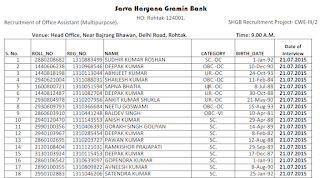 Latest News of SHGB Bank Interview: Sarva Haryana Gramin Bank (SHGB) is going to conduct personal interview from 21st July 2015 to 25th July 2015 for 100 posts of Assistant (Multipurpose). The SHGB interview for Office Assistant (OA) Multipurpose will be held at venue at Head Office, Near Bajrang Bhawan, Delhi Road, Rohtak at 09:00 AM onwards. If you are waiting for interview schedule for office assistant (Multipurpose) posts. You can download your SHGB Interview Schedule from direct link given below. SHGB Interview Letter 2015 for Office Assistant (Multipurpose): SHGB has declared online result on 05th July 2015 based on the cut off marks prepared on the basis of marks obtained in IBPS RRB CWE III held in September 2014. 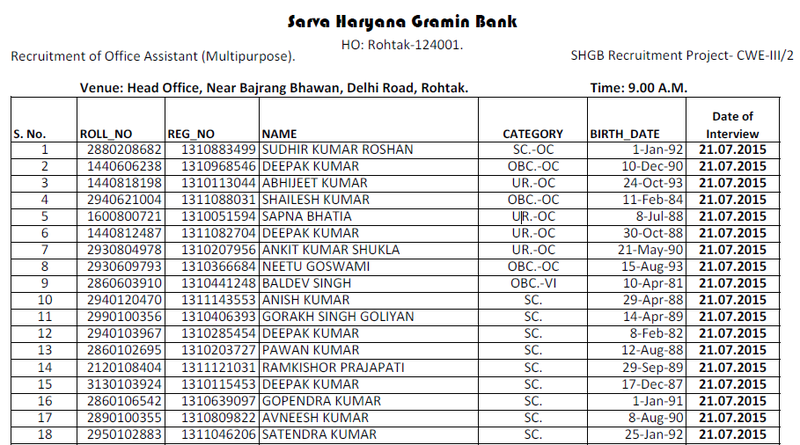 SHGB has released list of shortlisted candidates who are called for interview held at venue at Rohtak. In this interview list of candidates, SHGB has mentioned full name, roll number, registration, category, date of birth and date of interview of the candidate. The interview letter for these shortlisted candidates will be sent by post to their permanent address which was given at the time of filling online application form for SHGB Assistant (Multipurpose) recruitment 2015-16. As it is mentioned about that SHGB interview letter for Office Assistant (Multipurpose) posts has sent to your respective address registered on bank’s official website. This means that no interview letter will be available on official website. You need to follow few easy steps to download SHGB interview schedule for Office Assistant (Multipurpose). These steps are given below. Step 1: Click on the direct link to download Interview Schedule for SHGB Office Assistant 2015. Step 2: Download the interview schedule in PDF and save it on your PC/ Computer. Step 3: Press Ctrl + F and write your name in search box. Press down arrow key till you find your name in the list of selected candidates for Office Assistant (Multipurpose) Interview released by SHGB. Step 4: Note down your date, time & venue of personal interview for SHGB OA Recruitment 2015-16. List of Documents required for Personal Interview: You are required bring following documents for SHGB interview for Office Assistant (Multipurpose). SHGB will conduct your personal interview with document verification to check / match your originality / candidature with respect to the information provided by you during the registration. The list of documents required for SHGB Interview for Office Assistant is given below. · Interview Letter duly attested / self-attested by you. · Original fee payment receipt (Fee Challan/ Print out / Hard Copy). · Print of the online application submitted. · Print of IBPS RRB CWE III Scores / Mark Sheet for the stipulated examination. · 10th Mark sheet in support of local language i.e. Hindi.